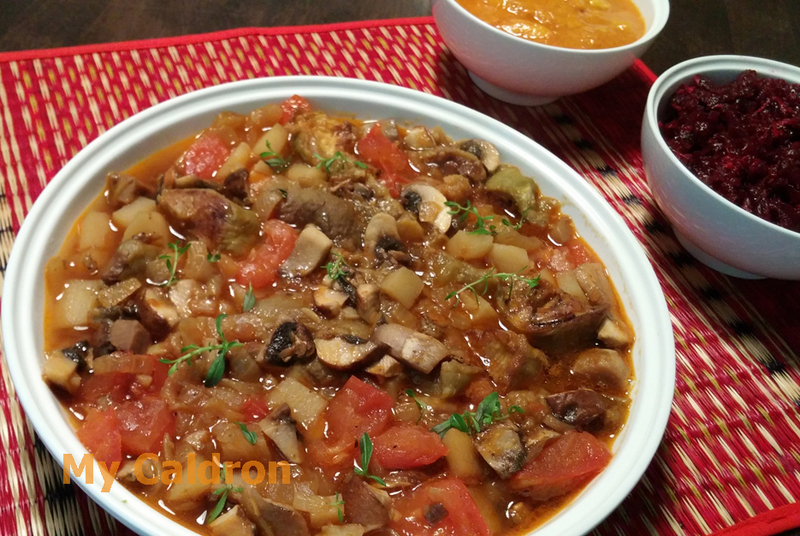 This is a modified version of an eggplants curry which I once tried in an Indian restaurant and absolutely loved. It is made of my favorite vegetables eggplants, portabella mushrooms, red potatoes and tomatoes; it is also aromatic and absolutely gorgeous looking. So, give it a try if you are in for fried garlic, turmeric, black pepper and curry. As a stew, it is best served with white rice. 2 Ping Tung Long eggplants (the long and dark purple ones), which in my opinion are the most tender and tastier eggplant kinds. Meanwhile, in a medium pan, heat one tbsp. of oil and sauté the onions over medium heat till they turn golden. Add minced garlic and turmeric and continue frying for another minute. Finally add and fry tomato paste before removing from the heat. Add two glasses of lukewarm water along with cubed potatoes. Cover the lid and cook for about 10 minutes over medium heat or until they are semi-cooked. Once the oven-baked eggplants are golden, take them out and half in cut. Then add to the pot along with chopped tomatoes, portabellas, curry powder, black pepper powder. Cover the lid and simmer for 20 minutes. 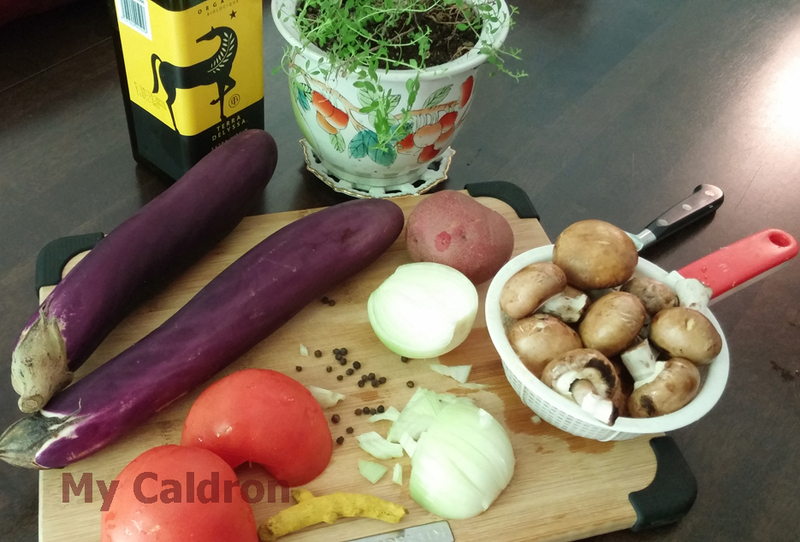 No salt was added so far because as you know tomato paste, curry powder and our eggplants all contained some salt. Taste to see if you need to add any more salt. If so, dissolve it in the lime juice and add. Otherwise add only lime juice and simmer another 5-10 minutes. The stew should have little juice at the end and it should not be runny. So adjust the water along the way. Add fresh herbs on the top of your serving plate for extra aroma and fine look. Bon appetite!